Kristin Qualls, the curator of the Museum of American Glass at WheatonArts, told GLASS in a phone interview that GlassWeekend and the “Emanation” exhibition component (there is also the studio aspects of the program) are a match made in heaven, and linking the two events was mutually beneficial. “It was sort of a natural in that GlassWeekend provides a crowd of people who are interested in glass art and would be interested in the works that we’re making,” she said. 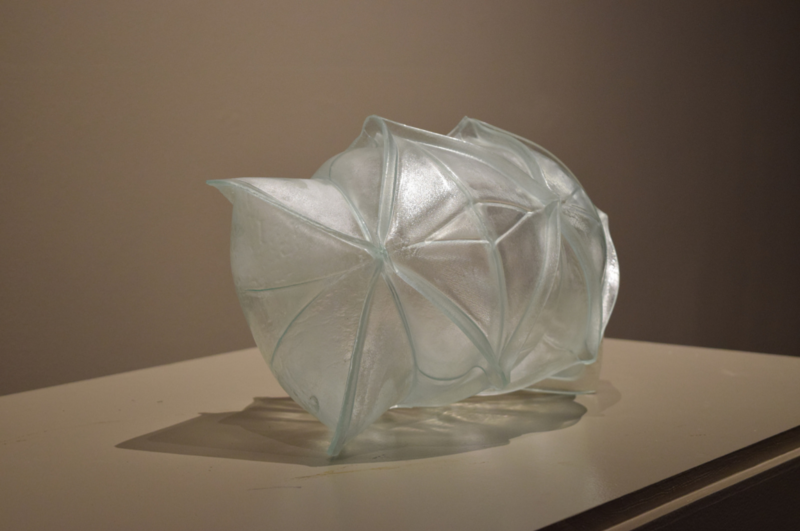 By opening “Emanation” during GlassWeekend, a connection is made between the collectors who desire to be engaged by cutting-edge contemporary work with the artists who create it, all neatly packaged within WheatonArts’ campus. WheatonArts' glass studio creative director and organizer of "Emanation" Hank Adams told GLASS over the phone that the experience of "Emanation" is as much of a learning tool for the artists as it has the potential to be for the audience. Artists have the opportunity to experiment with colors and forms, and for many, experiment with the medium as a whole in Wheaton's studio facilities. This aspect of the process is translated into the exhibition by displaying a number of the failed experiments, which still make up only about one tenth of the objects that are made during the fabrication process. "Some of this work will probably go nowhere," he said. "It’s just to inform the artist’s process." The artists also gain a unique perspective on their own work by interacting with their audience directly, both during the installation process and while the finished work is on display. Adams said that "We’ve been doing residencies for 35 years, but nobody knows what the product is," and so "Emanation" actively fosters a relationship between the artist and the audience by displaying work that is made on-site. One aspect of this audience-artist relationship is built during the installation process, which audiences can witness in real time. Hank Adams said that the process of installing the work is as much a part of the exhibition as the work itself. "It’s not art necessarily presented as a completed package. We do something called an organic opening, we call it. We do the install open to the public over a three-month period," he said. Susan Gogan, the Executive Director at WheatonArts, told GLASS in a phone interview that the layout of the museum generally allows for this, instead of the usual method of closing off galleries while exhibitions are being installed. She calls it a “really nice, organic exchange between our visiting audiences and the artists engaging each other.” This direct connection between the audience and the artists, along with the connection between the artists and the actual creation process, streamlines the flow of ideas from inception to realization to consumption and appreciation, a phenomenon growing ever-rarer in the world of contemporary art. Flock the Optic’s installation in the schoolhouse building on WheatonArts’ campus engages with audiences by challenging and distorting the ways that they view it. The piece is centered around a motorized flock of paper goose puppets—a reference to the group’s name which comes from the flocks of snow geese that flocked around their Alma mater, Pilchuck, in the winter—which flies in a circle. Viewers can look on with a distorted view, either peering through a water lens or a window outfitted with 380 kaleidoscopes, and thus “flock” their own optic. “When you view the piece, your view is totally obstructed and totally expended at the same time. 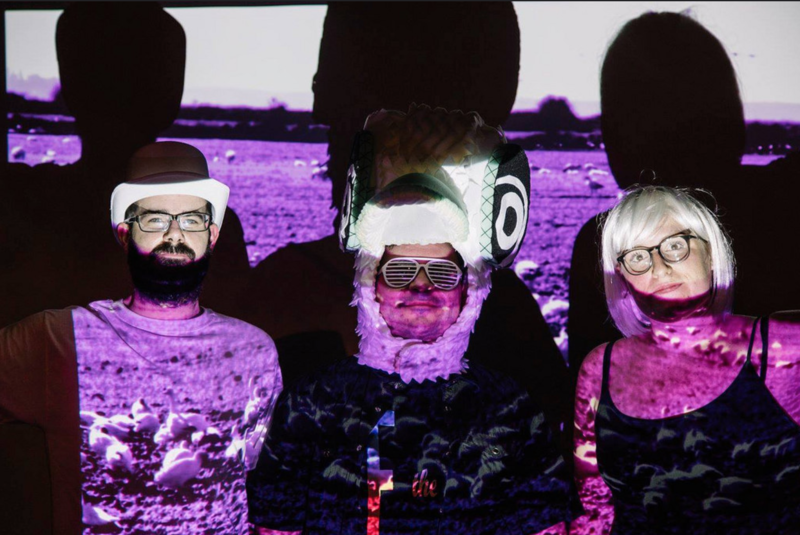 Any kind of weird, absurd optical thing we can throw in, we do as well,” Flock the Optic member Liesl Schubel told GLASS via telephone. Schubel, who also serves as education coordinator at UrbanGlass, said that this piece is one of multiple iterations, and had its genesis during her fellowship at WheatonArts in 2013, but as a hand-cranked operation instead of a motorized one. She said, “The original installation was in my artist’s studio at Wheaton Arts while I was fellow, and [fellow Flock member] David King came down and helped me with it,” which led to many discussions and reinventions until the installation at “Emanation” took form. 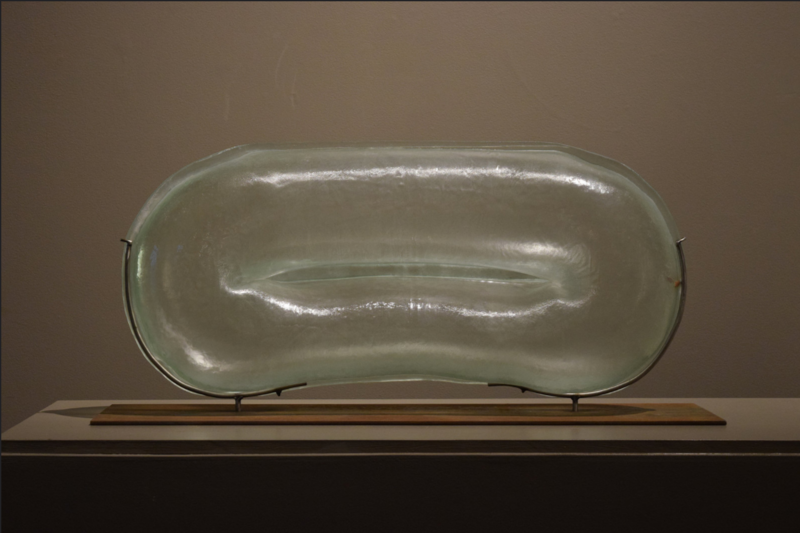 Also included in this year’s exhibition is Matthew Szösz, the Rhode Island born-and-educated artist known for his manipulation of glass forms. A Wheaton fellow in 2008, he has been invited back to contribute more of his iconic “inflated” work, similar to that which resulted from the 2008 fellowship to "Emanation". “For the "Emanation" exhibition, Hank (Hank Adams, Wheaton Arts Artistic director) . . . had a specific role that he wanted me to fill for the exhibition, with work that was similar to work that I had produced at my previous Wheaton fellowship, in 2008. I wanted to take advantage of the capabilities that are unique to Wheaton’s facilities, and work larger than I have previously attempted. The result is a series of large, formally simple glass inflations are caught between the fluidity and uncertainty of the process and planning and control of the form,” he told GLASS in an email interview.